The okra plant has some unusual horticultural cousins, including hollyhocks and hibiscus flowers. When garden soil warms sufficiently in the late spring, plant okra seeds for a harvest of green okra pods approximately 50 days later. Gardeners often use the small and tender okra pods for savory soups, stews and gumbo because the tasty and distinctive okra juice thickens hot dishes naturally, making the dishes into a hearty meal. Prepare the area where you will grow okra in the spring approximately one week after the final spring frost. Cultivate the soil down to a depth of 3 inches using the garden spade. Add 1 to 2 inches of compost or peat moss to the top of the soil and work the amendment into the soil thoroughly with the spade. Plant three or four okra seeds together (in clusters) 1 to 2 feet apart in the growing area. Cover the seeds with ½ inch of garden soil, and water the newly planted okra seeds to saturate the soil. Keep the soil around the okra seeds from drying out while the seeds germinate. Water when the soil begins to dry, but do not provide water to create puddles around the seeds. Thin the okra seedlings when the seedlings reach heights of 3 inches. Remove the weakest seedlings to leave only one plant growing 1 to 2 feet apart. Remove weeds as they appear around the okra seedlings by pulling them by hand. Manual weeding will prevent damaging the roots of the okra plants. Clip the okra pods from the okra plants with the pruning shears when the pods are between 2 and 3 inches in size. Clip the stems just above the pods with the pruning shears. Watch the okra plants every day so you harvest the pods before they become too large. 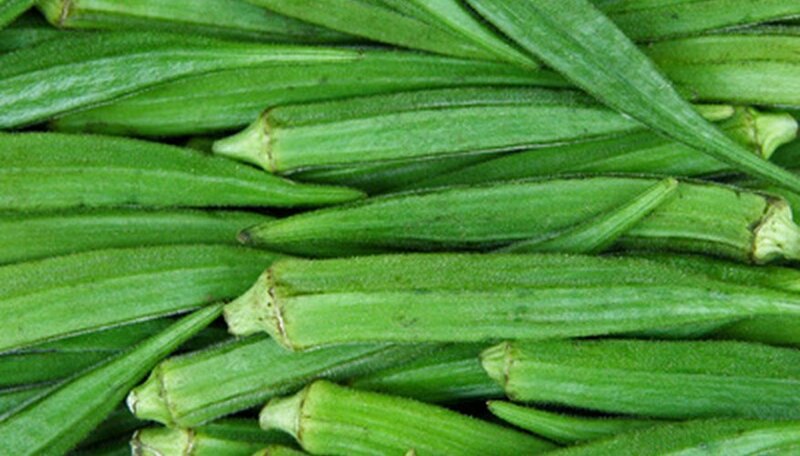 Large okra pods are not suitable for eating because they become too tough to eat. Wear gardening gloves when you work with okra plants to protect your hands from irritation caused by the okra plant foliage.